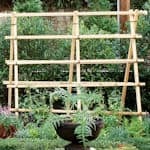 Here’s a bunch of ways you can make trellises for both vegetable gardens and flower beds, many are simple in design (and to make) while others are more detailed and fancy (with a bit of woodworking skill required). Quite a selection of materials used such as bamboo, wooden poles and sticks, lumber, wire mesh, etc. A couple of the projects below have been featured previously on Tipnut and moved here for better organization. Enjoy! 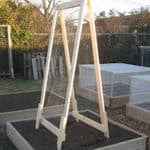 With Wire Mesh: Shares a tip to install panels of welded wire mesh along fencing. 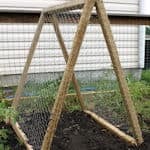 Wood A-Frame: With some plywood, hardware cloth, fasteners, basic tools, and a little time, you can fashion a hinged A-frame trellis to support peas, beans, tomatoes, or other vining plants. 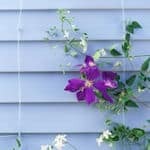 Invisible Tip: Eyehooks screwed into siding or walls and networks of medium-gauge wire hold delicate vines. (Heavier climbers, such as roses, will need heavy-gauge wire.) Grid design examples included. DIY Bamboo Project: Made with several canes of bamboo in different diameters and lashing cord. Portable Design: Made with lumber and chicken wire. Free pdf tutorial download available. 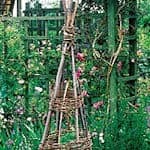 Rustic Design: Simple project made from prunings or substitute 1-by-1 stakes from the nursery or lumberyard. The finished structure is 7 feet 4 1/2 inches tall and 3 feet wide. 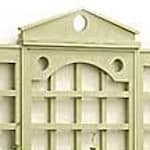 Topper Plans: Three different designs to choose from to top a classic design trellis, free pdf downloads. 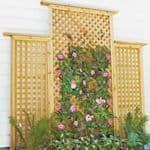 For Roses: The instructions are for an eight-by-four-foot trellis with a three-quarter-inch thickness, the strips of wood are spaced three inches apart. 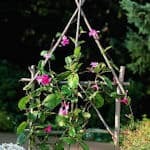 Easy To Store: When the season ends, either untie and store the trellis or leave it in place year-round for visual interest. 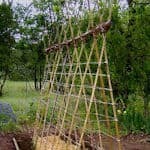 Rustic Ti-pi Tutorial: Made with three to six poles, 1 1/2″ to 2 1/2″ in diameter and 4′ to 7′ long, copper or galvanized steel wire and grapevines or flexible willow branches. 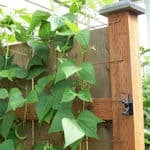 With Lattice Fencing: Here’s how to turn lattice fencing and 2x4s into a three-panel focal point. Plan diagram included. 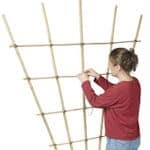 Bamboo & String Tee-Pee: Made to accommodate peas and cucumbers using scrap bamboo sticks tied together with cotton string.